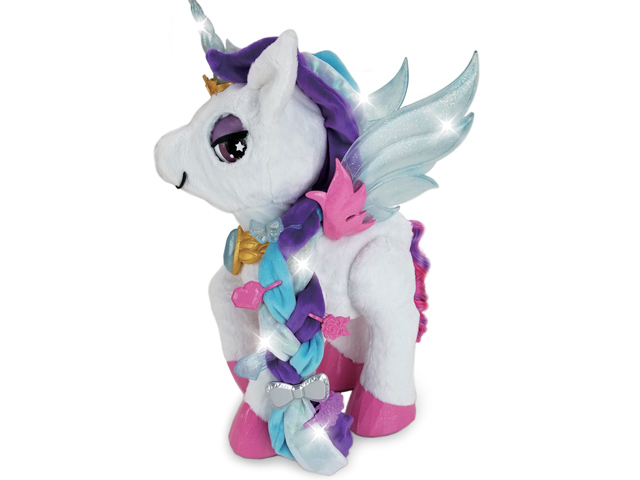 Experience the magic of Myla the Magical Make-Up Unicorn with songs, phrases, motions and magical make-up. Myla plays 5 sing-along songs and 10 melodies. When you put the microphone close to her mouth, she sings; when you remove it, it's your turn to sing along to the melody. Press the charm on Myla's magic necklace to learn more about her. She can tell you your lucky number and daily predictions. Myla's head and eyes move when she sings and talks; and she will respond to your care and kindness when you touch her back. Five sensors on Myla's horn, eyes and wings light up when you touch them with the make-up brush to display an array of colours. Mix and match your favourite colours to create a new look for Myla. The magical make-up brush and powder palette will help you beautify Myla, with many accessories to adorn her gorgeous mane. Everyone needs a magical Myla in their life.